Let’s relentlessly remove the guilt from our lives. There are two reasons that we want to relentlessly remove guilt from our life. The first is that it’s completely unproductive. We are busy. We ain’t got no time for that. The second is that it holds us back. From success, from joy, from helping others. I know that we all want more success. More joy, more love, more compassion, more peace. So, let’s work relentlessly to eliminate the guilt. I’ve found that many times guilt comes from thinking we aren’t good enough. And, thinking we aren’t good enough is called insecurity. I know, I hate that word too. And, I hate to think that I might be insecure. But, if we can build our confidence a little bit, we will start questioning ourselves less and believing in ourselves more. When we try something new, we turn “I can’t” into “I can.” And, guess what. Our kids see that. Trying something new could mean saying that thing to that person. It could mean holding a plank for 3 seconds longer than you think you can. It could mean going paddle boarding for the first time. So, here is something fun for you to try. Today. Like, right now. As you might already know, I love inversions. They are fun, empowering, and they improve strength, balance, and coordination. Not to mention, inversions look really beautiful and awesome. 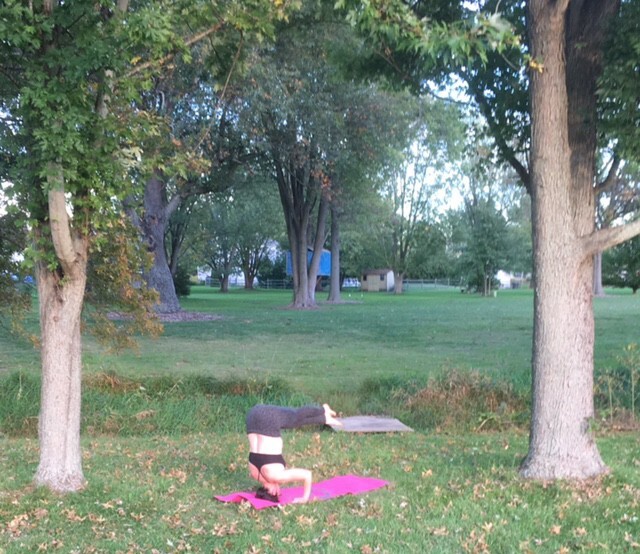 I want you to try out a tripod headstand, and send me your pics. Yes, I am completely serious. Here is a quick tutorial to get you started. And, you can always try this next to a wall if you are nervous about falling. First, start off with your head on the ground and place your hands in front of you to form a triangle. When you are ready, you can balance your knees up onto the backs of your arms. Keep practicing this pose. You might not get it right away. That’s okay. Half of the battle is being upside down, and having your head on the ground. This is practice for getting comfortable being uncomfortable… on and off of the mat. Once you start to feel even more comfortable, you can begin to press into your hands into the ground and lift your legs at the same time. Don’t worry, if you fall over you will just roll. Once you get really good at balancing, you can do some fun poses while you are upside-down. Okay, yes, sometimes there are legitimate excuses. But, most of the time, fear is what holds you back. So, try it! You can do it! And, please send me pictures!! PS — Have you taken the Free 5-Day challenge yet? Be brave. Be bold. Your life is waiting. Originally published at www.bridgettepetrino.com on October 15, 2016.